Not being the biggest slot fans here at Casinos Compared, we were very surprised by by the shear fun of the Wheel of Fortune video slot game. Anyone who has played on online slots will probably be disappointed by the rather unentertaining nature of the Vegas inspired slot games. What we been dying for for a long time is something that entertainment factor, something with the light hearted fun of the barcrest pub machines but the potential of big casino wins. The Wheel of Fortune has been the long awaited answer to our cries. 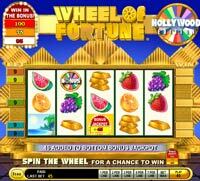 On the surface, wheel of fortune plays like any other 5 line slot. Payouts are valid on matching symbols from left to right (on a wagered payline). In the upper left corner of the play-field, there are three Bonus Jackpot Accumulators, each displaying a Bonus Jackpot award amount. Each time a Bonus Jackpot Symbol appears anywhere on the reels, the number of credits displayed on the symbol are added to the Bonus Jackpot Accumulator of the same colour as the symbol. 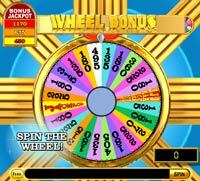 The Bonus Jackpot awards can only be won in the Wheel Bonus. The credit value of each Bonus Jackpot Symbol is based on your total bet. The yellow and orange Bonus Jackpot Symbols add the same number of credits as your total bet. The red Bonus Jackpot Symbol adds twice as many credits as your total bet. When you earn the Wheel Bonus, you will be able to spin the wheel for a chance to win one of the accumulated Bonus Jackpot awards. The Bonus Wheel has a colour coded Jackpot slice for each Bonus Jackpot. When you return to the 5-reel game after playing the Wheel Bonus, all of your Bonus Jackpot Accumulators are reset. The Bonus Jackpot Accumulators reset whether or not you won a Jackpot Accumulator award during the Wheel Bonus. The Bonus Jackpot reset values are based on the number of credits you bet on the payline that got you into the Wheel Bonus. The first time you play Wheel of Fortune, the yellow, orange, and red Jackpot Accumulators will be set to 50, 75 and 100, respectively. If the payline that first activates the Wheel Bonus has more than 1 credit wagered on it, additional credits will be added to the Jackpot Accumulator. This one-time boost corrects the original reset amount to be commensurate with your bonus-winning wager. 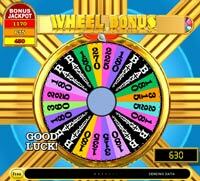 When you spin in bonus symbols on the first 3 reels (on a wagered payline) you'll be taken to the wheel bonus feature. After you reach the Wheel Bonus, click the Spin button to spin the wheel and earn a bonus award. After your spin, four slices (including your last winning slice) are replaced with a Bankrupt slice. Then you have a choice: take your win, or spin again for a chance to win more. If you click the Take Win button, you are taken back to the main game. If you land on a Bankrupt slice in the Wheel Bonus, you earn a consolation award and are taken to the Double or Nothing Wheel. You can choose to take your consolation award or choose to risk it and spin the Double or Nothing wheel. If you spin the wheel and land on a Double slice, your consolation award is doubled. If you spin the wheel and land on a Bankrupt slice, you lose all of your winnings, and you are taken back to the main game without winning any bonus award. 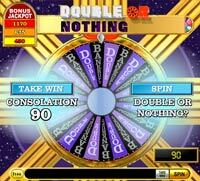 You may continue to play Double or Nothing until you click Take Win, until you lose by landing on Bankrupt, or until you reach the maximum number of Double or Nothing spins, which is 5. The Double or Nothing Wheel gives you a fair 50:50 chance of landing on either a Double or Bankrupt slice with every spin.